We have been asked many times if we breed turtles. Our answer is always the same. "No! They do that all by themselves." We do not breed turtles; we have turtles that breed. Other than putting males and females together, we do not know what else we could do to encourage them. And male turtles need no encouragement from us. We do retrieve eggs when we find a nest or see a turtle lay her eggs. The eggs are incubated in a simple incubator. While we enjoy seeing our turtles reproduce, they are pets not breeding stock. It is a pleasure to be sure when we have baby turtles hatch. Most of them are given away; only a few of them remain with us. About now you may be disappointed if you are reading this tour to learn how to breed pet turtles. You may have expected there to be more to it than that. Really there is not. Just give your sexually mature turtles sufficient housing to accomplish what is completely natural to them. All our adult turtles and older juvenile turtles spend the warm months in outdoors pens. They are free to mate and reproduce naturally. We also house different species of turtles together so some interbreeding is possible between subspecies. They have plenty of space in which to choose nest sites. Our pens are built tight enough to retain baby turtles we do not find until later. Your turtles may be breeding without you knowing it and you may be surprised when you find eggs in their enclosures or aquariums. We hear from many people who are surprised when they find eggs and do not know what to do. So this tour is intended to share with you some of the things we have learned including how to find eggs. See Tour Eight: Caring for Turtle Eggs to see how we incubate eggs. Some pet turtles probably spend more time breeding or mating than wild turtles do because they are confined and the males and females encounter each other more often if not continuously. The confines of a pet turtle enclosure may even be a problem because some males pursue females relentlessly. Male wood turtles and spotted turtles are well known for their relentless drives to mate. They often mount other males and turtles of other species. We had an immature male wood turtle who had a favorite rock he would latch onto and pound his plastron against. We are sure he knew it was a rock but he could not help himself. Male turtles need no encouragement from their owners. While the males are always ready and only need a female to walk by them to respond, females will also seek the attention of males when they are ready. Females may mate with more than one male and retain sperm for several years. Knowing who fathered babies is not possible if a female has had exposure to more than one male over a period of several years. Some people raise turtles in aquariums from babies and are surprised to find eggs in the water because the females have no choice but to drop them in the water. We do not have this problem, but we have had new arrivals drop eggs in our small turtle pond. Eggs dropped in water can hatch if they are removed and incubated. We have successfully incubated eggs we found in our pond. Eggs left in water will not develop. We are often asked how long eggs can be in water before they are not viable. We can not say. A few days should not be a problem. 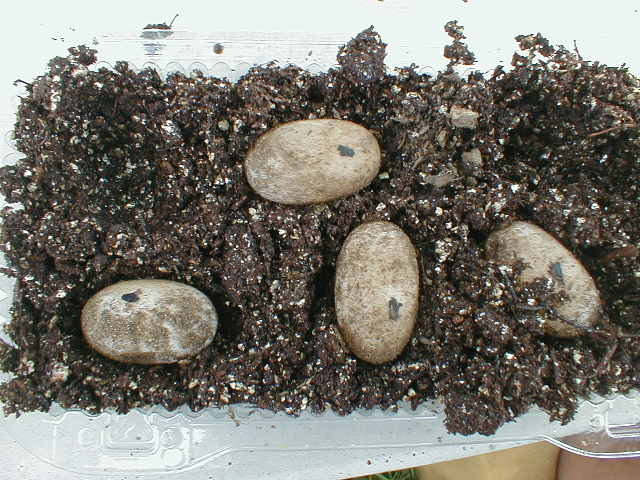 Keep in mind that buried eggs are subjected to rain which may saturate the soil for several days at a time. If an aquarium housed turtle does drop eggs in the water, she should be given access to soil so she may bury any eggs she still holds. She should be given several days to do so. If outdoor space is not available, a vivarium with 4" to 6" of soil may induce her to lay. If there is more than one female suspected to dropping eggs in water, each should be given solo opportunities to lay eggs. We have had eggs laid in a vivarium. We provide some improved nest sites in our pens. 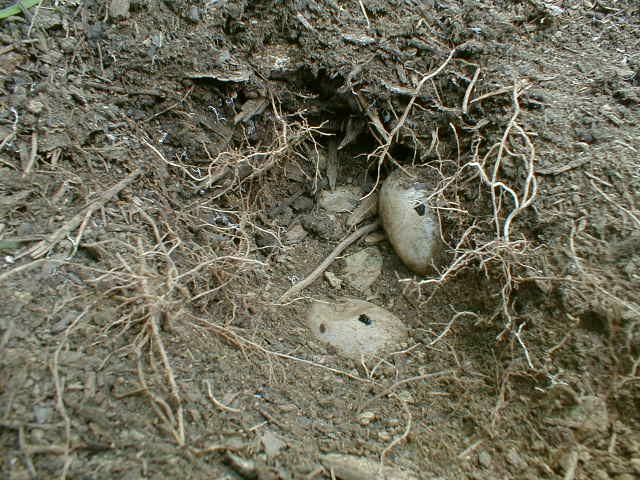 Eastern box turtles like bare well drained soil with good sun exposure. One nest site that has been used several times has been improved with the addition of sand and compost. Each spring before the nesting season it is turned over. All weeds, roots, and stones are removed. One year a painted turtle went to the prepared nest site to lay, but it was too dry for her. So we hosed it down and stirred the soil making mud to be sure it was wet a few inches deep. She watched us wet the area. She had communicated her needs and watched us respond. The next day she laid her eggs there. A second prepared nest site is located next to the pond in a sunny spot. The soil was replaced with sand rich with organic material. This site gets a lot of daytime turtle traffic and is not favored by most of the turtles for nesting. Our Gulf Coast box turtles can be very secretive and prefer to hide their nests near vegetation. Since they choose more challenging nest sites, aborted holes left uncovered indicate nesting activity. Once I followed a line of test holes in a place with many tree roots and just a covering of mulch. Gently stirring the mulch with my fingers I found the nest just beyond the last test hole. | pic 1 | pic 2 | pic 3 | pic 4 | pic 5 | pic 6 | pic 7 |. We would not have found this nest if we had not seen her laying her eggs. The nest was partially under the piece of wood, but still exposed to plenty of direct sun. Here is another Gulf Coast box turtle nest. This is typical of the sites these turtles choose. One Gulf Coast box turtle who was normally very secretive would sit in plain view from the house when she was ready to lay eggs. She would sit there in early afternoon looking into the house telling us she was about to lay eggs. The communication could not have been clearer. Then in early evening she would go hide her eggs. If we did not keep an eye on her, we would never have found her nests. That is the pattern we see with Gulf Coast box turtles. They are seen more than normal in late afternoon and early evening on the days they will lay eggs. They may linger in full view while they wait for evening. Before dark when it is quiet and the other turtles have settled down for the evening, they make their moves. They seem to know where they will bury their eggs ahead of time. Then they move off and get to work. They may finish before it is dark but often work into the darkness. We check on them enough just to know where they make their nests. This often means using a flashlight. We use a small light with just enough light to see them. Usually we will not be sure eggs were laid until we check the site the following morning. A covered nest means eggs were laid. Pet eastern box turtles are not as secretive and pick nest sites in open areas like our prepared nesting sites. A turtle may be seen pacing about in late afternoon as she picks a location. She may start digging in late afternoon or early evening. These pet turtles are not deterred by human activity nearby. Since they pick easier sites, they are not as prone to digging test holes. Painted turtles can be a challenge. Take a look. After digging what looked like a perfectly good hole and wetting it, she abandoned it. She moved about 12" and completed nesting. Notice how hard it is to see the real nest. We knew where it was because we watched her, but we did not want to use a flash to take more pictures. The eggs were recovered the following day. A few days later another painted turtle laid her eggs in the same area. The area had been disturbed in several places making the nest even harder to identify. However, there is a distinct feature to this nest - the plug. Also notice the grass clippings mixed in with the soil. The first painted turtle nest I ever tried to unearth in this very area frustrated me. The soil was so hard that I became convinced there was no nest. So in my frustration I dug more aggressively and damaged several eggs. I had read about the plugs, but it was my first encounter with a plug. Painted turtles are known for urinating on their nests as they pack down the soil. 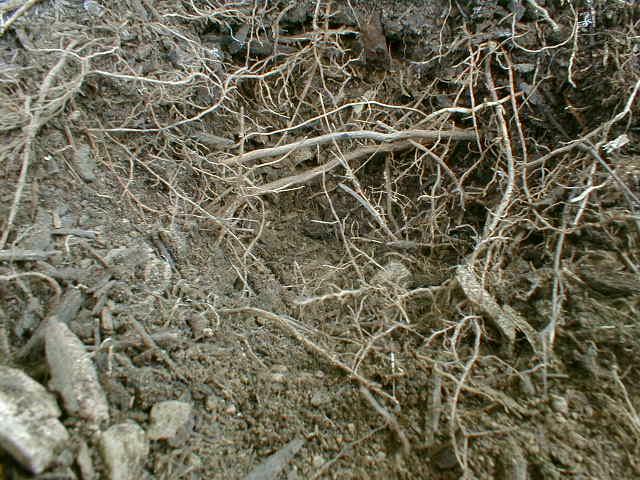 In soils that become hard this can create what is known as a plug which is a hard lump of soil. Since that time I have discovered nests in this area when I stepped on the plugs. The eggs were not harmed. So if you have painted turtles and you discover a lump of hard mud that seems a complete mystery why it is there, look underneath. You are probably wandering how a small painted turtle can pack down the soil to make a plug weighing as much as the turtle itself. If you ever saw a painted turtle doing it, you would understand. We call a painted turtle packing the nest dirt down a "dancing turtle". Digging and filling is a slow one foot at a time pace alternating the back legs each time. But the packing of the nest is more like a lively dance with its posteriors rhythmically moving up and down. Set to music the dance would make a great video for the internet. Our next example was prepared by one of our staff while this tour was being written. We did not see who she was which makes the following series of pictures even more interesting. Do you see the clues in pic 29 and pic 31. We had just removed weeds and wild strawberry plants in one of our pens in anticipation of some egg laying. After weeding we swept the stepping stones clean. Heavy thunderstorms followed. Two evenings later we noticed some dry soil on one of the stepping stones. Disturbed soil was another clue. After scraping away the loose soil there was another clue, dried grass trapped in the soil. We are sure this was a Gulf Coast box turtle, but we will never know which one. You will recall that we said Gulf Coast box turtles like to lay their eggs near vegetation. You can see these eggs hatching on the Baby Turtles Pictures Gallery. Nesting activity should not be confused with the daytime use of forms. Turtles like box turtles spend much of the day doing nothing more than sitting in a shallow depression in the soil. These depressions are called forms. It is just like a dog laying in a freshly dug hole. 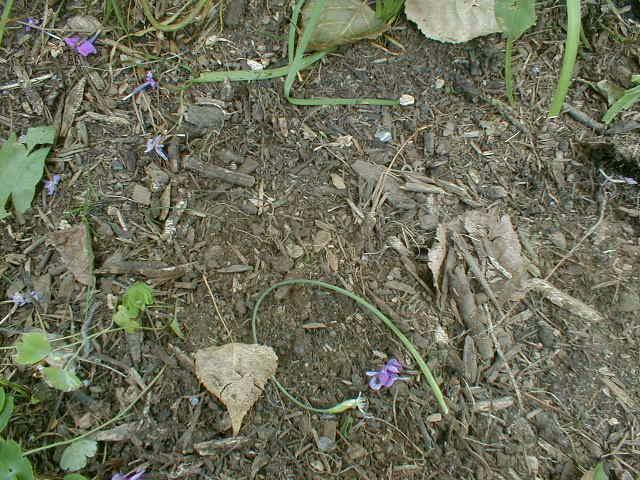 Forms are often among plants or near objects that provide some cover and concealment. Here is Wrinkles in a form. In summery, we do not breed turtles. Our turtles breed all by themselves. If you put a sexually mature male with a sexually mature female of the same species, they will breed sooner or later. If the female has soil in which to lay her eggs, she will do so. The trick is finding the eggs. The tricks to finding eggs is watching the turtles and reading the soil in a turtle enclosure. It is not difficult to recognize a female turtle about to lay eggs. In pic 13 above the nesting female painted turtle is alone in early evening. The other water turtles are in the pond. Notice the long shadows; this is a time in early evening when the turtles have settled down in the water. She is alone to do her work. We give nesting turtles plenty of space; we just want to know where they make their nests. The same scene may take place in early morning. So we frequently look for nesting turtles in nesting season in the early evenings and in early mornings. Of course some turtles nest later in the evening and some during the day. Some take hours and some are pretty fast. We do not always see them nesting so we look for signs of disturbed soil. Turtles are not the only ones who dig what look like test holes. Birds and squirrels may mislead us by digging holes that look like test holes. Birds usually leave pointed holes and squirrels leave scratch marks. When it happens also matters. The birds and squirrels usually dig holes before the turtle nesting season begins and squirrels again in the fall. After we disturb the soil in a prime nesting area such as by weeding, we water the area to settle the soil. We also do not let prime nesting areas dry out too much during nesting season because we do miss some nests. Basically we want enough moisture in the soil so that subsurface soil looks darker than the surface of the soil. Another trick we sometimes use is to draw a rake across soil creating parallel lines that are easily disturbed by turtles. This is especially useful when we have disturbed a large area. Domesticated turtles will often begin digging when we are nearby and clearly visible to them. Our attention does not bother some of them. Still we usually keep our distance because they have instincts telling them to hide their nests. We also usually wait until the following day to gather the eggs because we want to show some respect to the females who have just worked so hard laying their eggs. Do our turtles realize we gather their eggs? We think they do because they watch us do it. But we are in their space so often especially to feed them that they may not make the connection. Some turtles approach us when we are gathering eggs, but that is no different than when we are weeding and gardening in the pens. After drafting this, more turtles had to get into the act and demonstrate this. Here is Emily in the way as I unearthed another nest of painted turtles eggs. It was the plug in the grass that drew our attention to this nest. Emily just wanted attention. One spring we found a baby painted turtle. We searched for the nest and found an egg shell at the nest. In the nest was another baby. They over wintered in the nest. The nest was located in a very high traffic area and must have been stepped on numerous times. The eggs were no more than two inches deep. In the fall of that year the female laid seven more eggs just 6" away. While we worry about stepping on nests, they are surprisingly well suited for the intended purpose. We worry more about stepping on baby turtles after we find a baby. Dirt paths are popular nesting areas. One painted turtle laid her eggs in the exact same place three years in a row. The following year she moved about a foot away. She has always nested within two feet of the first nest site. This is typical of many of our domesticated turtles. We also keep a diary of notable turtle activities like egg laying. We see the turtles are pretty regular in seasonal activities like egg laying. We checked our records and knew it was time to clear space for the Gulf Coast box turtles featured above in pics 29 through 34. Knowing the timing of our turtles helps us know when to watch them more closely for signs of nesting activity. So if you have sexually mature turtles housed together, they will breed. You are not "breeding" them any more than you are breeding the rabbits in your yard. You just do what you need to do to provide for their regular needs like good housing and good diet. Breeding is just part of their life cycle that pet owners find very rewarding. It is common for our painted turtles to nest two or even three times in a season with as little as two weeks between nests. Other turtles may nest more than once in a season too. It is also common for the egg shells of a turtle's second and third nests to be much thinner than the eggs of her first nest. To prevent this we feed our turtles a diet very high in calcium in the spring before and during the nesting season. This diet consists of high quality turtle pellets, canned dog food supplemented with a calcium supplement, and eggs including the egg shells. Of course the males eat the same diet as the females. We find that all our turtles enjoy cooked eggs. In our house these are chicken eggs. The eggs are broken in a bowl including the egg shells and cooked in a microwave oven for about 90 seconds to firm all the liquid. Then the eggs are diced and served on a paper plate. For the water turtles a dish is placed by the edge of the pond. We do not feed them raw eggs or raw egg shells. 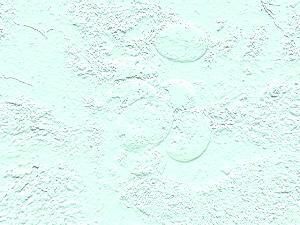 This high calcium diet does make a difference in the thickness of the turtle egg shells. Whether it makes a difference in the number of eggs laid we cannot say. Would you believe that breeding turtles can be controversial. Sometime we will write an opinion on breeding turtles. We hope you enjoyed our twentieth behind-the-scenes tour.